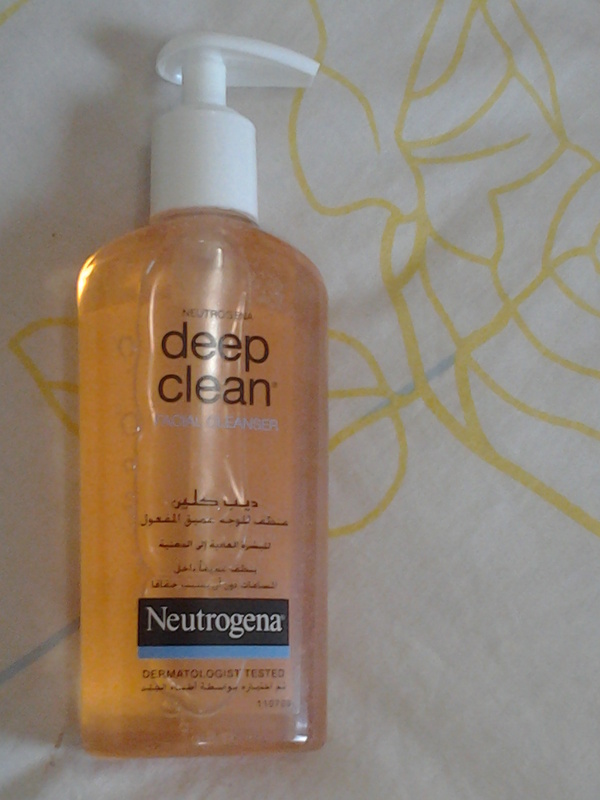 Review: Neutrogena Deep Clean Facial Cleanser! Today am reviewing a daily facial cleanser from one of my favorite brands, Neutrogena. It’s the Deep Clean Facial Cleanser, which is formulated for Normal and Dry skin. My skin type is normal at the moment but leans towards dry in winters. I was so excited to give this cleanser a try. It would be an understatement to say I fell in love with it!. I have been using this for three months now. It claims that it gently penetrates into the pores, dissolves dirt, oil and traces of make-up. I feel it really lives up to it’s claims. It’s very gentle and perfect for daily use. It lathers just the right amount, not overly too much. Without feeling heavy on the skin, it really deep cleans and removes impurities and dead surface skin cells, leaving your skin looking very youthful and fresh. It’s a lovely light orange colored, thick cleanser. It comes in a plastic bottle with a nice pump, which I love!. It’s very convenient to use and hygienic too. Since it’s a transparent bottle, you can keep track of how much product is left. It’s scent is really refreshing and relaxing. When using it, you really enjoy that feeling of cleanliness it delivers while that scent captivates your senses!. This product is oil free, non comedogenic and dermatologist tested. One bottle will last you a long time since you need only a single pump of product each time. The cost of this cleanser is AED 36.50 for 200ml. I highly recommend this. Infact a friend of mine (Irene of Drab to Fabz) bought this product after I suggested it to her. Not only did she absolutely love it, she said she should have started using it a long before itself. It’s that great! ← Giveaway and Book Blast: Hero’s Sword by M.E. Sutton! Lovely review, Naz. Neutrogena cleansers are great. :).. Thanks, Abi!. It’s pretty surprising that you have oily skin but yet this cleanser works great for you.. That proves how gentle and versatile this product is! Thanks, Chandni ♡. Surely, you will love it!